When it comes to gardening, one size DOES NOT fit all! When choosing a gardening method, it’s all about LOCATION, LOCATION, LOCATION. First, consider how much space you have to dedicate to your garden. Some of you live in an apartment, and can only do indoor gardening, or window gardening. Perhaps you have a balcony, deck, or porch that allows you a little more space and sunshine for container gardening. You might have a small backyard, which is well suited to square foot gardening. Or if you’re really lucky, you have land, and lots of it, so space is not an issue. The other aspect of location is where in the world you live. I envy those in California who can garden year round! In the south (Arizona, Nevada, Texas, and Florida) there are places where it’s too hot in the summer for a garden to grow. The farther north or higher the elevation, the shorter the summer becomes. Here is a brief overview of the different methods of gardening. Choose the one that best suits your circumstances. Imagine a large plot of earth tilled up, and organized in long rows. This is a traditional garden. It requires a lot of space, and a lot of work. It’s important to know what kind of soil you have (even get it tested at a local extension office), so you can add appropriate amendments. Sand or clay? Acidic or Alkaline? It’s always good to add compost–compost makes good soil better. Amending and working in the garden can be very labor intensive and requires equipment. This is not a good method for those with physical limitations that make it difficult to bend, kneel, etc. In the spring and fall the garden needs to be tilled–although you may be able to rent or borrow a rototiller, you will still want to own a hoe, shovel, pitchfork, and sometimes more. The other challenge with traditional gardening is weeds. Mulching can help, but you will inevitably battle as many weeds (or more!) as you have plants. Some of the benefits to this method–you can grow A LOT of food, and if you want to grow enough to eat now and store for later, traditional gardening is your best bet. If you have good soil the startup costs can be very low–just purchasing some seeds. For those with the space and energy, traditional gardening is a great option. Square foot gardening is a method that combines several strategies of intensive gardening. 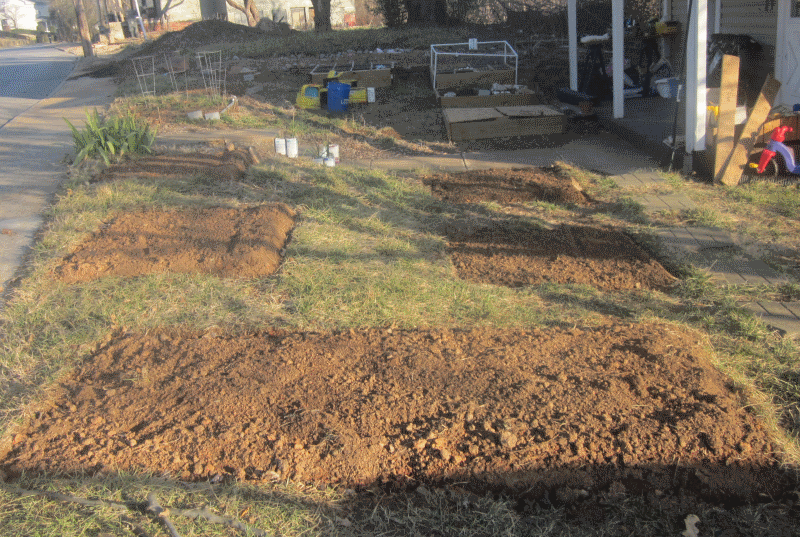 First, gardening beds are built and filled with soil. Raised beds are easier to access, especially for those with physical limitations. Square foot gardening recommends a mix of peat moss, vermiculite and compost–this is a very light soil that drains well, but also retains moisture for the plants. This eliminates concerns with very rocky, clay, acidic or other problematic soil. With this type of soil there is very little weeding to do. Plants are spaced very close together, eliminating “rows.” This method also utilizes vertical gardening–supporting plants with trellises, staking, etc. This reduces the space needed on the ground by growing vining plants up instead of out. The disadvantages of this method–the startup costs can be much higher because beds must be built or purchased, and soil must be replenished each year. You may need fertilizer to provide enough nutrients for the plants to grow and thrive. Compared to traditional gardening, this method may not generate as much produce per plant. For those with very small yards or just a balcony or a porch to use, container gardening is a great option. 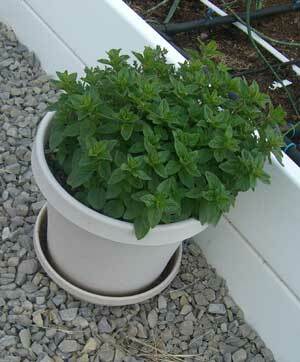 From large tubs (like the Earth Box) to small pots, food can be grown in a very small space. Many “urban gardeners” use this method. Fortunately, many “dwarf” varieties have been developed to help those growing in such small areas. The advantage is–space. It requires very little. The disadvantages are that your harvest may be limited, the soil will need constant improvement and fertilizer, and plants grown this way can be more susceptible to disease. While houseplants may live and even thrive inside, it is difficult for plants that are trying to create fruit to get enough energy from indoor lights. A window might provide enough light to grow salad greens and herbs. Another great option is to provide artificial light, like the AeroGarden . By “sheltered gardening” I mean use of a physical shelter like a greenhouse, row covers, or cold frames. In areas where the summer is short and temperatures stay cool, this might be the only way to have a successful garden. Many gardeners in normal climates use these to extend the growing season. This requires equipment (the various shelters) which can be expensive. I have chosen to use a modified square foot gardening method. It was easy to set up, it is easy to maintain, and I am very happy with my harvests. Hopefully you will find a method that works well for you! I would never have said anything about a disadvantage of a square foot garden being reduced harvest. The fact is that a traditional row garden will never be able to keep up with the yield of a single row no matter how hard you try. And you do it in 20% of the space with 90% less work. No weeding, no thinning, no heavy digging, and you save 98% of the seeds. You can’t beat a SFG no matter what you do. There might be other methods out there but they all end up either being too much work or too expensive and complicated because you’ll have to know about chemicals, fertilizers, soil composition, etc. None of that plays a factor in a SFG. In fact, the people who have the most success with a SFG are brand new gardeners who know very little about garden because they’re able to keep things simple and not get bogged down from all the “expert advice” that’s out there. I am not an expert on container gardening. I can tell you that peppers need at least 12″ in the garden, so I think a 12-15″ pot would do. They need minimum 8 hours of sun per day, preferably 12. Cucumbers can usually be spaced 3″ apart, but I think I would use a 12-15″ pot and grow 2 in it. They also require a lot of sun, 8-12 hours. Onions will need regular watering–check the soil daily. They would do better if they had a little shade. In general they are a cool-loving plant. I would like to grow bell pepper (green and red) in pots on my patio. What size container should I use and how much sun will it require? I also would like to try cucumbers in pots. Same question. I have onions in a long planter. They are barely sheltered. Will get a lot of sun but very little rain. Do they require much water? Thank you so much. I think you could possibly put a patio box (with a bottom) on concrete, but I would be very concerned about blacktop–I think it will just get too hot for the plants. Instead, pick the sunniest spot in your yard and put a square foot garden there. If that’s not a possibility, maybe do a raised bed (like one on legs). The method does say that a trowel of compost added to each square is enough. I just find my beds “sink” quite a bit throughout the season, and because the soil is at least 1/3 compost, it decomposes and has to be replenished. I add at least 2-3 cubic feet of new compost each spring. The comment about the fertilizer is also from my experience–I found that my harvest improved immensely when I started fertilizing. Hey Emily! I love your blog and your gardens are absolutely beautiful, however, I am an avid Square Foot Gardner and would like to make a few notes on your “disadvantages” of the SFG method First, the soil is not replaced every year, the same soil is used year after year. After harvest time when a crop is finished, you mix in one trowel of new compost and it is ready for the next crop to be planted. Also, the method uses NO fertilizer. If you are using a good blended compost (Mel suggests a minimum of 5 varieties of compost to make the 1/3), it will provide all of the nutrients the plants need. The key is to have a good variety of composts, the Mels Mix you can buy in a bag uses more than 10! Good luck this spring and happy gardening! Ellen – Plant dill among the squash. I didn’t have any squash bugs or pests of any kind until the dill died (not sure why, guessing it needed more water than I gave it). Once the dill died, the army of squash bugs took over. It was ugly. I tried organic powder, it killed the plants. I tried soapy dishwater, it helped, but not much. The only thing I did that worked was to manually remove the leaves with little brown eggs on the bottom and squish every bug I could find. I am, however, going to try the organic remedies posted in response to your question if it happens this summer. Darcy–Square foot gardening definitely gives you more in less space. So you can grow TONS more in 16 square feet with a SFG compared to 16 square feet of a traditional garden. However, if you have the space, with a traditional garden it’s easier to get a large harvest for less money. For example, I generally plant 4 squares of green beans. However, this does not produce enough to preserve any (frozen or canned). I would guess I need to plant at least 16 squares, maybe more. Well, that’s an entire garden bed! The cost of building the garden and mixing the soil is high–compared to one row in a traditional garden. Does that make sense? 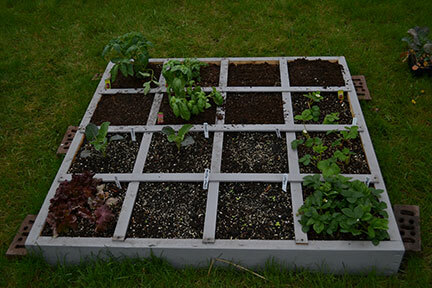 If you’re short on space, go with square foot gardening. If you want to preserve enough to eat all year, you will likely have to have a very large traditional garden to get that kind of yield. Hi from Wisconsin! I’m looking at starting a raised bed, square foot gardening style. I also have a traditional “rows” garden. You mentioned a disadvantage of the square foot method is reduced production vs. the traditional garden. I thought one of the advantages to square foot gardening is supposed to be a greater yield using less space. I’m wondering, if I dedicated the same amount of space that I use for rows now to square foot raised beds, would I get a better or worse yield? Thanks for the good info here, and for your help. My squash has been taken over by the squash bore, also there is a brown bug with a very hard skin eaten on it to. Is there any thing I can spray on them that would be organic? Or maybe something I can mix up that is organic? I AM PLANTING A GARDEN IN A SQUARE BOX FOR THE FIRST TIME. BEFORE I PUT THE SOIL IN DO I NEED TO PUT PLASTIC DOWN SO WEEDS WON’T GROW? IF NOT PLASTIC WHAT WILL KEEP THE WEEDS FROM GROWING UP IN MY GARDEN?